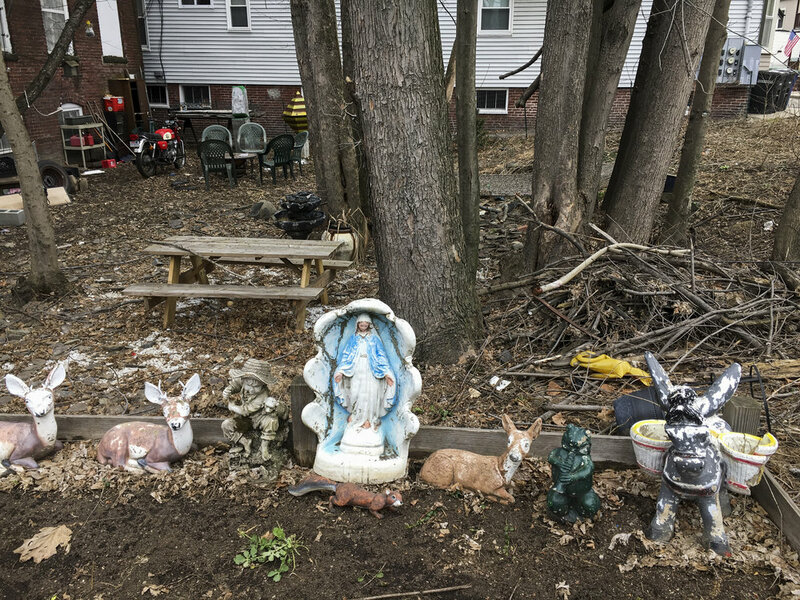 While statues usually stand alone in their abodes, it is not uncommon for homeowners to add additional statues and figurines to their shrines, creating small assemblies of divine beings. Visually unique assemblages result when statues of earthly creatures, both human and animal, as well as carefully chosen miscellaneous objects, are added to the shrine. Less fortunate friends from high places sometimes stand vigil nearby, without the protection of an enclosure. The animal kingdom is well represented as well. Some of the animal figurines accompanying the statues, such as sheep, have symbolic meaning in Catholic iconography. Other animals, especially dogs, increase the numbers and variety of the Virgin or saints' attendants, and at the same time, express the homeowner's love of animals. Sometimes homeowners enhance their assemblages with text messages, which can express Christian values such as friendship and welcome, or perhaps grief for the loss of a loved one or pet. Other assemblages are more whimsical or eccentric—and some simply bizarre. The visual excess displayed in these singular tableaux is nothing short of awesome.